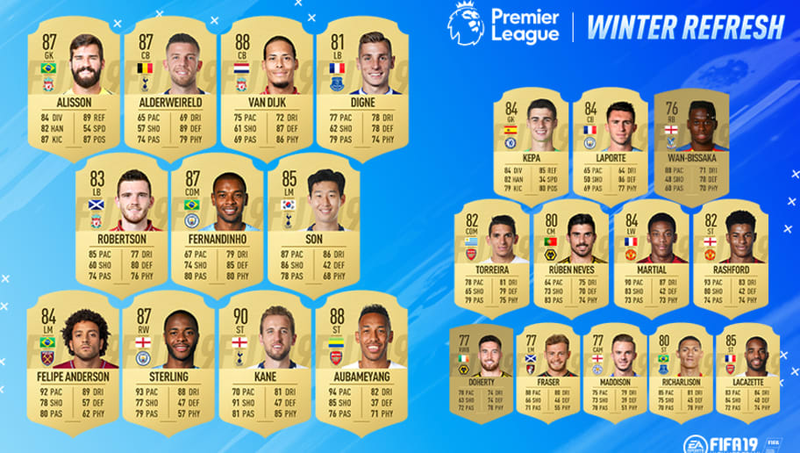 ​EA Sports have released their annual winter refresh for FIFA 19 Ultimate Team, which has seen an increase in the ratings of 23 Premier League players, as well the release of new special cards. The popular video game franchise has rewarded a number of players who have shown impressive form over the first half of the season, with a number of high-profile stars receiving boosts to their already impressive ratings. The update from EA Sports also contains new special cards, such as 'Winter Ones to Watch' and 'Prime Icon Moments', both of which will be highly sought after by players looking to add limited edition items to bolster their Ultimate Team. Here is 90min's breakdown of the FIFA 19 Winter Refresh. To keep the game as up-to-date as possible and to reward the recent form of many of the Premier League's established key players and new breakthrough stars, there are 23 upgrades entering the game. ​Liverpool's defensive solidity this season has seen goalkeeper Alisson, Virgin van Dijk and Andy Robertson all rewarded with improved in-game ratings. Alisson has jumped from an 85 to an 87, Van Dijk from an 85 to an 88 and Robertson has moved from 81 to 83. ​Manchester City's ​Fernandinho and ​Raheem Sterling are both now 87 rated players thanks to their respective performances in City's title defence, while Manchester United's resurgence under Ole Gunnar Solskjaer has not gone unnoticed from EA, as pacey attackers ​Anthony Martial and ​Marcus Rashford are now 84 and 82 rated respectively. ​Tottenham attacking duo ​Harry Kane and ​Son Heung-min have been rewarded for their fine attacking displays, with Kane now 90 rated and Son an 85. Meanwhile, across the north London, ​Arsenal strikers ​Pierre Emerick Aubameyang and ​Alexandre Lacazette have both been rewarded with increased ratings - with Aubameyang now an 88 and Lacazette an 85. The biggest improvement however is at ​Crystal Palace, where right-back Aaron Wan Bissaka has leapfrogged from a silver 70 to a gold 76. This update covers the most notable transfers to take place during the January transfer window, celebrating the moves with new special cards. Anyone trying to build a Ligue 1 team should look for new Monaco pairing ​Cesc Fabregas and Naldo, who both have 86 ratings. New Marseille forward ​Mario Balotelli also has a new 83 rated special card after his switch from OGC Nice. Premier League new boys ​Michy Batshuayi, Nathaniel Clyne, Denis Suarez and Ryan Babel also feature with new cards in the update. The new cards have been created to commemorate a special individual moment in the career of an existing FIFA 'Icon'. Not every 'Icon' has received a new special card, as they will be released in groups, with only group one being revealed so far. There will be a total of 34 special cards released, with group two set to be revealed at a later date - giving Ultimate Team players plenty to look forward too over the coming weeks and months. For fans of the Premier League, 'Icons' to look out for from group one include 92 rated Steven Gerrard, an extremely quick 94 rated Thierry Henry and Ruud van Nistelrooy, who is 93 rated.